Settlers and officials leveled criticism at the government for passing the measure. "It was a behind-the-scenes trick," one official said. "This story was covered up." 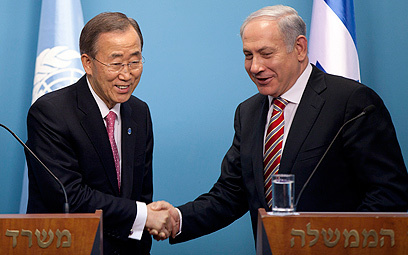 Some officials claimed that the exclusion was tied to United Nations Secretary-General Ban Ki-Moon's visit to Israel, saying that it was Netanyahu's attempt to uphold his commitment to the US and Europe that the government won't do anything that might encourage settlement construction. "The Americans must have exerted pressure to reverse the decision," one minister said. The Prime Minister's Office refused to release the names of the ministers who votes for or against the measure. On Wednesday, Netanyahu said in a joint press conference with the visiting UN chief that the government's approval of the initial, inclusive list was a mistake. happened, we fixed it with a telephone vote," he said. Netanyahu denied caving to international pressure on the matter. Yesha Council Chairman Danny Dayan sent a letter to government ministers, urging them to rescind the exclusion of the settlements. "It's a grave decision blatantly discriminating against the West Bank settlements," Dayan wrote. He further asked the ministers to hold another debate on the matter at the Knesset plenum. See all talkbacks "Gov't to withhold aid from settlements"